The global aviation warning lights market is projected to expand at a CAGR of 6.5% during the forecast period. According to the report, the global market would continue to be influenced by a range of macroeconomic and market-specific factors in the near future. Increasing demand for high-rise skyscrapers and government regulations and policies to increase adoption of obstruction lights for aircraft safety have increased the penetration of aviation warning lights worldwide. In terms of lamp type, the global aviation warning lights market has been segmented into LED, xenon, and incandescent. The LED segment is expected to continue to lead the global market during the forecast period, due to advantages offered by the LED technology. The segment is projected to expand at the maximum CAGR of 7.1% from 2019 to 2027. Obstruction lights are LED-based distinctive lights that are used as warning lights indicating the presence of obstructions. These warning lights are crucial for use during the night or in conditions with poor visibility. A recent development is the use of arrays of high-power red LEDs in place of incandescent bulbs, which has only been possible since the development of LEDs of sufficient brightness. LED-based lamps have a significantly longer lifespan than incandescent bulbs, which reduces maintenance costs and increases reliability, thereby boosting the demand for LED aviation warning lights. Furthermore, several manufacturers are focusing on developing medium-intensity white strobes based on the LED technology to replace xenon. Xenon flashers, while being more impressive visually, tend to require frequent replacement. Hence, they have become a less-favored option. Benefits offered by the LED technology are expected to propel the LED segment during the forecast period. 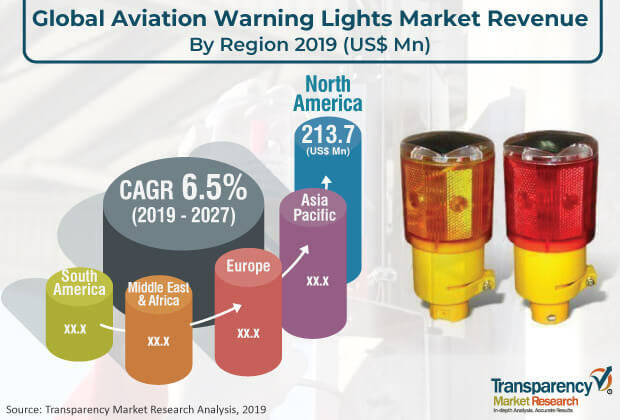 In terms of revenue, North America accounted for the maximum share of the global aviation warning lights market in 2018, due to growing construction activities and rising investments in new airports in the region. Furthermore, presence of a large number of high-rise buildings and towers in the region is augmenting the market in North America. The U.S. held the maximum share of the aviation warning lights market in North America in 2018. The market in the country is estimated to expand at the maximum CAGR during the forecast period. Rapid growth of the construction industry and early adoption of LED aviation warning lights are some of the factors likely to fuel the market in the region. The market in Europe is likely to witness significant growth during the forecast period. Development of aviation infrastructure and rising investments are fueling the aviation warning lights market in several countries of Europe. The U.K. held the maximum share of the Europe market in 2018. Demand for aviation warning lights systems in Asia Pacific is likely to remain concentrated in China, India, and Japan in the near future, owing to growing construction activities and rising incidence of aircraft accidents in these countries. Among countries in Asia Pacific, the market in India is estimated to expand at the maximum CAGR during the forecast period, due to presence of a significant number of tall buildings and telecommunication towers in the region. Market players are increasing their investments in the market in Middle East & Africa (MEA) to expand their presence. The market in GCC is expected to expand at a significant CAGR during the forecast period, due to growing penetration of aviation warning lights in the sub-region. In terms of revenue, Brazil is expected to hold a significant share of the aviation warning lights market in South America throughout the forecast period. The profiling of key players operating in the global aviation warning lights market includes company overview, major business strategies adopted, SWOT analysis, and market revenues for years from 2016 to 2018. Key players operating in the global aviation warning lights market are Astronics Corporation, Avlite Systems, Cooper Industries Inc. (Eaton Corporation plc), Delta Obstruction Lighting Ltd, DeWiTec GmbH, Flash Technology, LLC. (SPX Corporation), Wetra Aviation Obstruction Lights, Drake Lighting, Inc., Dialight plc, Contarnex Europe Limited, Avaids Technovators Pvt. Limited, Hughey and Phillips, LLC., Orga BV, Q-AVIATION, Farlight, and Sirena SpA. This comprehensive report by Transparency Market Research analyzes the aviation warning lights market at the global and regional levels. The report provides analysis for the period from 2017 to 2027, wherein 2018 is considered the base year and 2019–2027 is the forecast period. An in-depth and unbiased market assessment has been made to offer readers comprehensive and accurate analysis. The report analyzes all major trends likely to influence the global aviation warning lights market from 2019 to 2027. It also analyzes driving factors, restraining factors, and opportunities for the market. The study provides a perspective on the aviation warning lights market, in terms of five regions: Asia Pacific, South America, North America, Middle East & Africa, and Europe. The report includes detailed value chain analysis, which is focused on providing a widespread view of the global aviation warning lights market. The value chain analysis section includes a list of active market participants, marketing channel analysis, and market positioning of participants. The report also includes analysis and forecast of the production of aviation warning lights, which includes production volume of these lights in every region. Porter’s five forces analysis has also been provided in the report to help understand the competition scenario of the market. The study incorporates market attractiveness analysis, wherein product type, application, and lamp type segments have been benchmarked based on their market size, growth rate, and attractiveness. The report also includes attractiveness analysis of the market in every region in order to help understand the competition scenario of the aviation warning lights market. The overview section of the report analyzes market trends and dynamics that include drivers, restraints, and the current and future opportunities for the global aviation warning lights market. Market outlook analysis has also been provided in the report. Additionally, the report offers analysis of business strategies adopted by key players operating in the global aviation warning lights market. The introduction chapter provides a snapshot of different trends in the global aviation warning lights market. In terms of product type, the global aviation warning lights market has been segmented into low-intensity warning lights, medium-intensity warning lights, and high-intensity warning lights. In terms of application, the market has been segregated into towers, chimneys, building infrastructure, cranes, airports, and others (water tanks, wind mills, water towers, etc. Based on lamp type, the global aviation warning lights market has been divided into LED, xenon, and incandescent. The report provides region-wise segmentation of the global aviation warning lights market and categorizes it at various levels, thereby providing valuable insights at micro and macro levels. The report also highlights the competition scenario of the global aviation warning lights market, by ranking all major market players according to their geographical presence and key developments. Insights for the global market is a result of extensive primary interviews, secondary research, and in-house expert panel reviews. Market estimates have been analyzed by considering the impact of different economic, political, social, legal, and technological factors. In terms of country, the market in North America has been classified into the U.S., Canada, and Rest of North America. The market in Europe has been categorized into Germany, France, the U.K., and Rest of Europe. The Asia Pacific market has been segmented into China, Japan, India, and Rest of Asia Pacific. Middle East & Africa covers GCC, South Africa, and Rest of Middle East & Africa. South America comprises Brazil and Rest of South America. This report provides all strategic information required to understand the global aviation warning lights market along with its product type, application, and lamp type segments. Additionally, the report provides insights into the market across all regions. Primary research involves telephonic interviews, e-mail interactions, and face-to-face interviews for detailed and unbiased review of the aviation warning lights market across different regions. Primary interviews are usually conducted on an ongoing basis with market experts and participants in order to obtain the latest market insights and validate the existing data and analysis. Primary interviews offer new information on important factors such as market trends, market size, competition landscape, and growth trends. These factors help validate and strengthen secondary research findings. Moreover, the data collected and analyzed from secondary and primary research is discussed and examined by TMR’s expert panel. The research study includes profiles of leading companies operating in the global aviation warning lights market. Market players have been profiled in terms of attributes such as company overview, financial overview, SWOT analysis, business strategies, and recent developments. Key players operating in the global aviation warning lights market are Astronics Corporation, Avlite Systems, Cooper Industries Inc. (Eaton Corporation plc), Delta Obstruction Lighting Ltd, DeWiTec GmbH, Flash Technology, LLC. (SPX Corporation), Wetra Aviation Obstruction Lights, Drake Lighting, Inc., Dialight plc, Contarnex Europe Limited, Avaids Technovators Pvt. Limited, Hughey and Phillips, LLC., Orga BV, Q-AVIATION, Farlight, and Sirena SpA.